One Moby Grape cover and one original from this band that I had never heard of before. The original doesn't veer to greatly from the sound of the cover, so if you enjoy that sort of thing you will probably enjoy this even though it came out in 1977. Is the band name a somewhat veiled reference to doing spots? 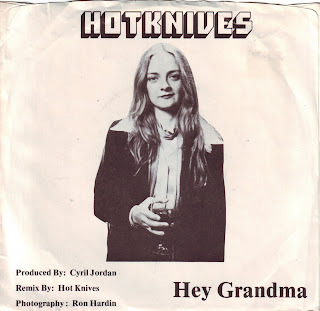 Ladies and gentlemen, for your listening pleasure, Hot Knives. This single is obviously Flamin' Groovies-related. Hot Knives is a way of smoking hash without papers or a pipe. It's vet slang.